Signs of a heart attack lasting longer than two minutes (may include pressure, squeezing or pain in the center of the chest, and/or chest pain with lightheadedness. Call your primary care physician first. If you’re not sure your condition is an emergency, call your regular physician who is most familiar with your medical history. Your physician may be able to recommend the best course of action, which may or may not include a trip to your emergency room. Bring identification and insurance cards. Always take identification and insurance information with you to the emergency room. This will help expedite the registration process. Know your prescriptions and allergies. Bring a list of active medications, dose and frequency, or bring the prescription containers with you. If you have allergies to medication or foods, or have specific illnesses, bring a list of these conditions so you can easily provide the information to the care provider. Prepare this list in advance before an emergency and keep an updated copy in your wallet or purse. We have provided a pre-printed sheet in this booklet for you to use. Also, if you bring your medication bottles with you to the emergency department, don’t forget to have someone (family member or friend) take the medications home for you to prevent loss. Know the phone numbers and the route. Be sure to include the phone number of your physician and the emergency department in your cell phone or in your list of important numbers. Also be sure the route to the hospital. Bring a pad, a pen, and a friend. A friend or family member can help you ask questions that you may not have through to ask. Carrying a pad and pen will help you keep note of specific details such as doctor recommendations. 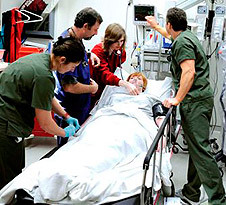 Patients are seen in the order of severity. Just because you arrive to the emergency room before someone else does not mean you will see a doctor first. Patients are seen based on the severity or acute nature of their illness. Ask the admission/triage nurse at check-in if they can provide assistance with pain management, which may include ice or hot packs, pillows and blankets. Prepare for the unexpected. If you have young children, don’t forget that you may need to provide all the necessary information and guidance to babysitters, neighbors, afterschool activity advisors, etc. If necessary, be sure the right people know if you child has special needs or severe allergies. If the child swallowed what may be poison, bring the bottle with you to the emergency room. Additionally, bring activities or toys to keep young children content while waiting.